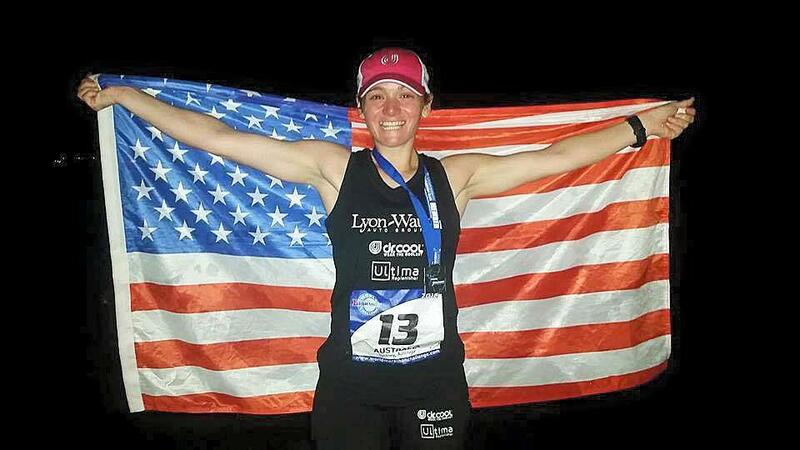 Becca Pizzi, 35, of Belmont has completed 45 marathons. Becca Pizzi is an unlikely sports star. Pizzi is a 35-year-old single mother who lives in Belmont, runs a day-care center, and manages an ice cream parlor. When she told her mother she wanted to compete in the World Marathon Challenge with consecutive 26.2-mile runs in Antarctica, South America, North America, Europe, Africa, Asia, and Australia, the answer came quickly: She was absolutely crazy. But the feisty 5-foot-1-inch, 125-pound Pizzi seems to have been born to run. She already has completed more than 45 marathons, including 15 Boston Marathons, and she trains up to 100 miles a week. “Being from New England, I’ve run in all sorts of conditions, sub temperatures and 100 degrees, so I thought I had a fair shot at it,” she said Saturday in a telephone interview from Sydney, Australia, where she had finished the marathons. 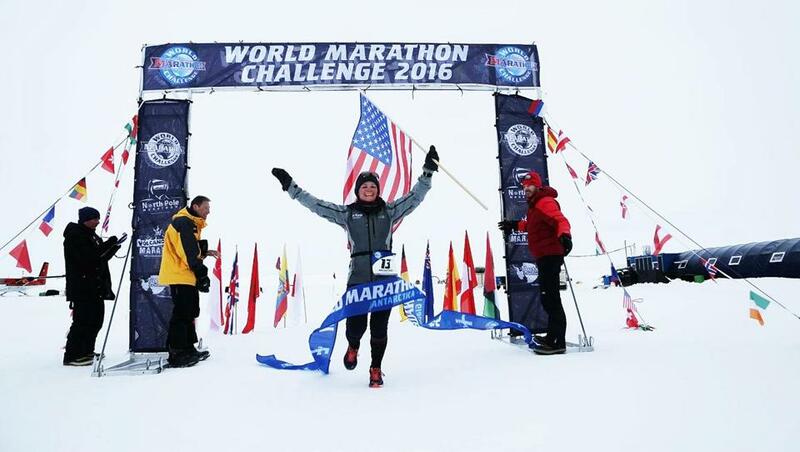 Becca Pizzi is trying to become the first American woman to complete seven marathons on seven continents in seven days. That she did. Pizzi, averaging 3:55:11, this weekend became the first woman to cross the finish line in all seven marathons. Both she and men’s winner, Daniel Cartica, a Marine from Chicago, set world records in the competition. Pizzi said she had only one close call. It came in Dubai, where she suffered what she believes was a groin muscle tear at mile two and went down hard. “It was as if I had a knife sticking out of my groin,” she said. Writhing in pain, she thought of home — and of Tom Brady. “Tom Brady said, ‘I didn’t come this far to just come this far, [we’ve got further to go]’ and that hit me. And I thought about that,” she said. She also thought about Taylor and all the people who were pulling for her. Someone got her some Advil and she forced herself to move on. She was running her slowest time, a 4:14:41 with her head down, but she was moving. “I knew I could make it if I walked, but I didn’t want to take seven hours,” she said. The $36,000 trip, mostly covered by sponsors, started off with lost luggage in New York and two missed flights. Participants ran a total of 183 miles and spent 59 hours in the air, flying nearly 24,000 miles around the globe. “Everything that could go wrong before I got to Chile went wrong, but you figure it out,” she says. The first marathon was Jan. 23 in Union Glacier, Antarctica, 600 miles from the South Pole. Next stop, on the following day, was Punta Arenas, Chile, where fierce winds were blowing. “My daughter wrote me a note, if you’re chilly in Chile, eat chili. So, I though of her and did that,” she said. There were some Bostonians among the onlookers who yelled “Boston Strong” as she went by, she said. And in each remaining continent she would have different family and friends to cheer her on. Monday in Miami Beach was chock-full of family and friends including her college coach and a 9-year-old girl named Tommie whom Pizzi has been mentoring. She and Tommie ran the last 6 miles together. “That was the highlight of that run,” she says. Asked about jet lag, Pizzi laughed. Eating was mostly done at 33,000 feet. At the next stop, Tuesday, in Madrid, Pizzi got a surprise. Marianna Zaikova, who last year became the first woman to complete the course, joined her for half the distance. Pizzi would later easily shatter Zaikova’s world record. “I didn’t know if I would’ve had the guts to do this myself if I didn’t watch them do this last year,” she said. Marrakesh, where she ran on Wednesday, was tough because it was just 12 hours after Pizzi crossed the finish line in Madrid, but she said she loved it. After a while, Pizzi said, she began to feel like a superhero. Pizzi was also Skyping with her daughter, and the whole Wellington Elementary School in Belmont was following the journey. On Thursday came the injury in Dubai. When Pizzi’s mother found out what had happened, it was the middle of the night in Belmont. Susan Pizzi could not go back to sleep, but she kept the faith. “I knew if Becca had to crawl across that finish line then that’s what Becca would’ve done,” she said. In Sydney, Pizzi cried near the end of the last marathon as her boyfriend waited at the finish line early Saturday morning, just past 3 a.m. Soon after she finished, Taylor got on the school intercom at Wellington Elementary School. “My mom finished strong,” she reported proudly. Pizzi says she learned a lot from this marathon of marathons, in which all 15 contestants, including four women finished. A parade is scheduled to be held in honor of Pizzi’s feat at 3:30 p.m. Thursday in her hometown of Belmont. And a flavor might be named after her at Moozy’s Ice Cream in Belmont, where she is the manager. Her favorite? 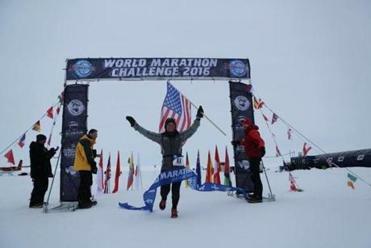 Pizzi crossed the finish line in Antarctica, the first of the seven races of the World Marathon Challenge.